A fire broke out in the center portion of the Empire Cold Storage facility at approximately 10:09 am today. Initial arriving companies reported a working fire. Assistant Chief Brian Schaeffer and Deputy Chief Dave Leavenworth were in the area and arrived on the scene shortly. Chief Schaeffer assumed command and requested a 2nd Alarm. The fire eventually went to a 3rd alarm utilizing 14 of the city fire department's 17 units along with a ladder from the Valley Fire Department. A short time after being on scene, signs of structural collapse were observed and forced firefighter evacuation of the building and the incident going to a "Defensive" mode. The facility stored approximately 100 tons of frozen food products. As a part of the cooling process the facility uses the chemical Anhydrous Ammonia. This is an extremely dangerous chemical that can react violently to fire creating a number of hazardous situations. Due to this chemical being on site and potentially exposed to the spreading fire, an evacuation was initiated in an area of 500 feet in all directions of the structure. There were two separate Anhydrous Ammonia storage tanks at this location. One contained 2000 lbs of the chemical and the other 2500 lbs. Fire crews concentrated on protecting these storage tanks from fire as well as fire from spreading to other parts of the building. The main building was generally divided into 3 areas separated by fire walls. The fire originated and thus far has been contained to the center divided area. Water streams from aerial ladders and ground deluge guns were used to put water on the fire. There were some initial challenges for Firefighters to find and dig out fire hydrants. The city water department was extremely helpful in finding and digging out additional hydrants for possible use. As the fire department gained control of the fire, the mandatory evacuation order was lifted at approximately 1:15 pm. During the height of the incident, several city fire stations were filled with mutual aid units from surrounding fire departments and districts including the Valley Fire Department and Fire Districts 8, 9 and 10. It is anticipated that the Spokane Fire Department will have units on the scene for several hours. PROBABLE CAUSE: Preliminarily it has been determined that the fire was started by a cutting torch removing a portion of an awning that had collapsed from snow load over the weekend. Apparently, the awning collapse caused a gas leak during the weekend. The gas was immediately shut down by the utility company and had no contribution to the fire. The building owner hired a contractor to repair the damage created by the awning collapse. In order to complete the repair, it was necessary to cut away a part of the awning from the main structure on the north side of the building in the center of the building. It was during the cutting operation that the fire began. Fire Investigators will conduct additional work on the scene after the fire is totally extinguished and it is safe to do so. DAMAGE EXTENT: The center of the building received extreme fire damage. At this time the extent of damage to the frozen food products stored at the facility is not know. 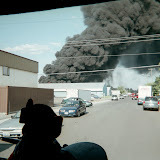 NARRATIVE: On December 28th, 2008 at 12:02 P.M. the Spokane Fire Department responded 5 engine companies, 1 ladder company, 1 pumper ladder company, 1 rescue unit and 2 battalion chiefs to a structure fire located at 608 N. Maple. This originally was reported as a possible transformer on fire as it was near a power substation and the caller was viewing this from a distance away. Engine 3, the first to arrive, could tell as they approached the area that this was more than just a transformer burning as there was a significant amount of dark colored smoke in the air. They immediately asked for a full alarm and upon arrival, discovered a wooden storage shed that was burning right next to a commercial warehouse and office facility. It was then reported that a person may still be inside the storage shed. A rapid primary search was begun along with an interior fire attack. The fire was impinging on a large metal garage door next to the storage shed and ladder crews began to force entry to the interior of the warehouse to prevent any further extension of fire. The fire was successfully kept out of the warehouse. Firefighters were able to knock down the fire and completed their searches in 15 minutes. The cause of the fire is unknown at this time however the Spokane Fire Department Special Investigation Unit is currently investigating its source. There were no injuries to firefighters or civilians at this fire. The storage shed and its contents received heavy damage. The warehouse garage door sustained heat damage. A total of 26 firefighters responded on this blaze. DAMAGE EXTENT: The wooden storage shed received heavy fire damage. The warehouse and office facility garage door sustained moderate fire damage.